SAN JOSE – Recently Happy Hollow Park & Zoo (HHPZ) revealed five new “story stations” located near benches throughout the park and zoo, providing places for families to learn while relaxing and enjoying books provided by the San José Public Library (SJPL). “The partnership between PRNS and SJPL benefits our community and many children,” says Councilmember Tam Nguyen. 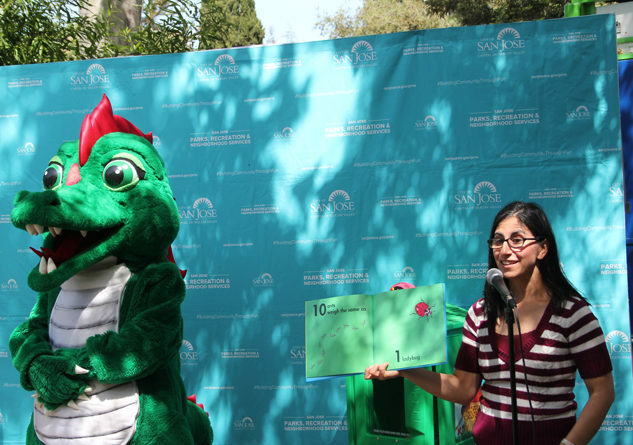 “It promotes the goal of ensuring children enter school ready to learn and read at grade level.” Danny the Dragon and Councilmember Nguyen joined the celebration, followed by a story about pollinators read by SJPL staff. To conclude the festivities, the Happy Hollow Park & Zoo conservation team invited guests to help release 10,000 ladybugs in the park. The new story stations will include a variety of animal and nature themed books. Guests are encouraged to return the books to the stations once they are finished to allow other families to enjoy reading at the park and zoo. Special story times from the Library’s Early Education Team will be available Tuesdays, Thursdays, and Saturdays at HHPZ at 10:30 a.m. during the entire month of May at Happy Hollow Park & Zoo.